Full Impact MMA - GET IN THE CAGE! Will you be a one punch knockout specialist? Maybe you prefer to make them beg for Mercy… Either way, you're here to WIN! This is your Chance! You're here to fight in the world of Mixed Martial Arts; to test yourself against some of the biggest names in the world of Professional Fighting and prove that you have the skills to compete and walk away the Champion! Start fresh with a clean record and a background in a Striking or Grappling sport of your choice. Pick your moves, enter Tournaments and destroy the competition! Advance your skills as you climb the ranks, honing your abilities with every victory! Play Alone or with Friends..solo play to as many people as you like! Full Impact MMA is coming to Kickstarter to fund a print version and will see a revision to the Rulebooks into a new version for streamlined play. The 'Get in the Cage' feature is to flesh out a unique and specialized Fighter Profile collection that's largely User Created to give the game even more content. Those Fighters will be YOU, the backers. This is your chance to become a world famous MMA Fighter in spirit if not in the flesh. The Fighter Profile pack will consist of converted files from the Havok's Bootleg Collection and any "Get in the Cage" Fighter Profiles created as part of the Pledge Rewards. This could get big! ALL BACKERS from $1 and up can download the Original Full Impact MMA Core Rulebook. Look at Update #4 for details. Official Fighter Profiles created for Backers of this Campaign! I'll handle the heavy lifting, you can provide as little as a name or as much as a complete moves list, signature move, height and weight, etc. You get to make one Fighter Profile as part of each pledge, but maybe want to add some friends? Maybe you want to start with an Advantage and come to the ring a Living Legend? Full Impact MMA is a fast paced dice combat game that simulates the action of an MMA bout. Using a pair of common D6 dice, some pencils and a couple Fighter Profiles you can roll out a match in a few minutes. A match can last as long as three full rounds (30 fight actions) or a single crushing blow can end your night! Check the FAQ if you want to know even more! High detail Play by Play matches can be seen here. Samples of Havok's Bootleg 1.0 Fighter Profiles can be downloaded here. **Please Note these versions are only compatible with Original Game Ruleset. The goal is to have the main game booklet and Havok's Bootlegs ready to drop shortly after the campaign ends. Fighter Profile creation from Campaign Backers will take the most time and will be done up after the Main Book + Bootlegs are completed. I have a quick fill document ready to go for those but they'll still take a lot . Profiles will be released as created and collected together into a single document when all are done. How long they take depends entirely on how many we make! Prepwork to get the book ready for DriveThruRPG is already in the works, but I'll need to finalize everything before I can get final approval. That won't hold me up from getting everything as ready as possible beforehand. DriveThru has a proven track record and I've purchased many things through them so there's little to no risk there. The level allows you to join in the conversation and get your name in the book as a FIMMA Supporter. A survey will be sent with some basic questions and an Official Fighter Profile will be created and included in the game. 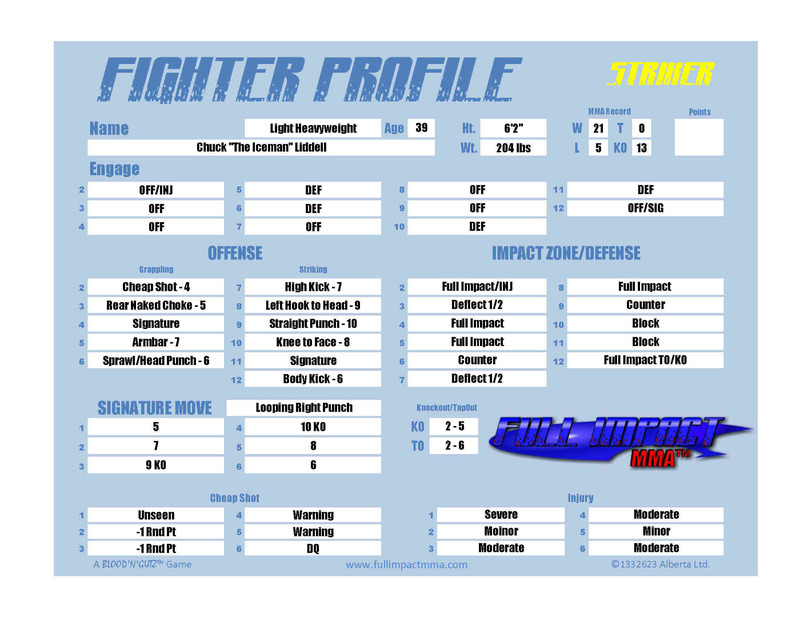 You will receive a PDF of an Official FIMMA Fighter Profile for your character. GET BACK IN THE CAGE! Create a Legendary Fighter Profile! A survey will be sent with some basic questions and an Official Legend Fighter Profile will be created and included in the game. - All Backer Created Fighter Profiles in PDF Format. - FIMMA Complete + Havok's Bootlegs 2.0 in Softcover Print and PDF Format. **There will be a print version of the Additional Fighter Profiles offered at cost following the campaign. Shipping will be handled by DriveThruRPG. See Rewards Section on main campaign page. - FIMMA Complete + Havok's Bootlegs 2.0 in print and PDF Format. **There will be a print version offered at cost following the campaign.